Similar to SQL, Sqlite is a relational database management system, which is developed in C language. However, in comparison with SQL and other database management system, it has different working approach. Sqlite is a server–less database i.e. does not require any server for management and it is embedded into end programs. 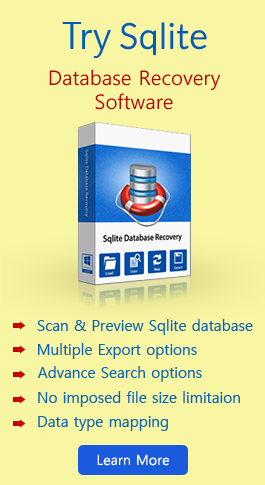 ACID properties maintenance is the most important feature in Sqlite. Today it is widely used in browsers, smart phones, operating system, etc. In this blog, we will deal with Blob data type and the measures to view the blob data in Sqlite. What is Blob In Sqlite? A blob is the data that is present in the same format as it was input. It is in binary form and cannot be understood by human. This is available in form of an image, video or other multimedia things that is stored in Sqlite database. It was invented by Jim Starkey at DEC for not defining any confidential data into simple form that could easily be understood by other normal users. Therefore, such data type can be used to store the confidential data. According to forensic investigators, such type of data might contain some important credentials that are useful in investigation of cybercrimes because generally the browsers, smart phone, etc. use Sqlite for storage purposes. Binary Data: It is initiated to handle the encoded binary data and represents NULL values. File: The field consist name of file that indicates a file within disk. BLOB: This attribute refers to the separate table (Blob) in database. Manual Measure: The measure, which involves writing of some commands and executing them in Sqlite command interface, is known as Manual Measure. However, by executing the commands the output will also be in a non-readable format. Sqlite provides a query ‘quote’ for viewing the contents in Hex form but this will only be understandable by the user who understands Hex form and not by normal users. Therefore, it is a non-reliable measure for viewing data in Sqlite. Using Blob Viewer: Another solution is by using a third party solution i.e. using software. Sqlite Blob Viewer is one of the software that we would suggest you because the tool extracts the Blob data easily and user can view it, as it is present in an understandable form to users. This software converts the non-understandable data into understandable data and hence you can view the Blob data of Sqlite. We conclude with the fact that as such no manual procedure exists that allows us to view the Blob data in Sqlite database. the Sqlite Blob Viewer is only the measure for our problem providing us with many additional features at the time of conversion.